The wastewater treatment facility of the remote mountain resort community of Pinecrest Lake bears the brunt of spring runoff and increased summer demands in the area's beautiful surroundings. Pinecrest Lake lies in the Sierra Nevada Mountains between Yosemite National Park and Lake Tahoe. The community has a listed population of about 230 people, but from June through August the real population booms to 8,000 to 11,000 as summer vacationers descend on the area and put a significant burden on the town's wastewater treatment plant. The only such facility in the area has a flow capacity for discharges of about 30,000 gallons per day (gpd) in colder months. In the summer, that jumps to 174,000 gpd. 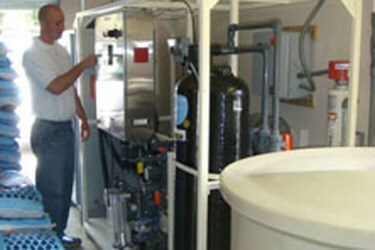 Additionally, the plant used an aging, undersized and inefficient electrochlorination system - along with screening, rotating biological contactor (RBC), clarification pond, and a percolation and evaporation pond. In the summer, the electrochlorination system operated 24 hours per day. They needed to replace the existing system in an environmentally sensitive ecosystem and conscientious community with the added constraints of limited space, limited access to deliveries - particularly in the winter - and a quick installation. To meet these needs, Evoqua Water Technologies suggested the OSEC® B-Pak on-site electrolytic chlorination system, which generates a 0.8% sodium hypochlorite solution through electrolysis of brine, consuming only water, salt, and electricity. It can produce 250 lbs/day of chlorine. Instead of running around the clock like the old electrochlorination system, the new OSEC B-Pak system runs about three hours a day in the summer and once a week in the winter. The only additional system upgrade was for the extreme weather conditions, replacing an original heater to accommodate water temperatures that reach about 4°C (39°F) in the winter. The new system decreased the amount of salt consumption, from four truckloads to only one truckload per year - saving significantly on costs.